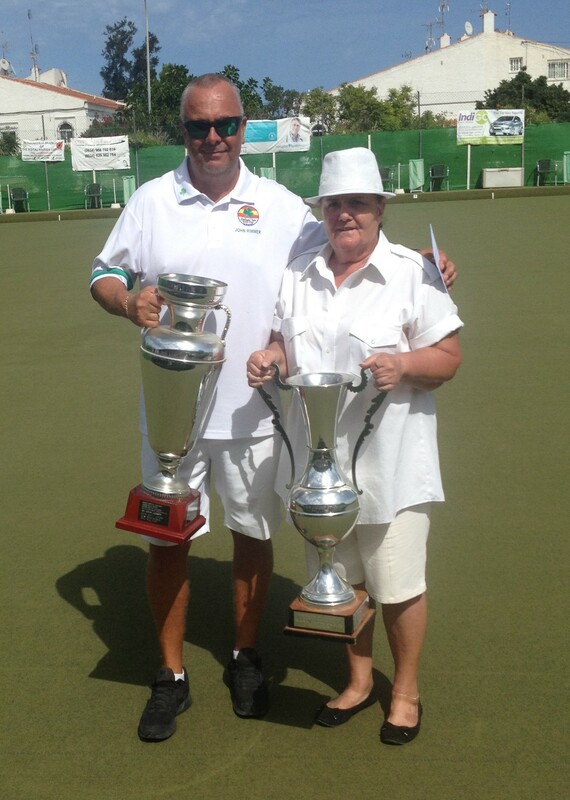 The Semi-Finals and Finals of this competition were held at San Luis Bowls Club from the 8th to 11th September. 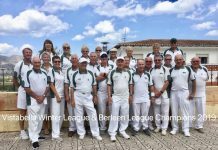 What a start we had, on Saturday the Semi-Finals of the Men’s Pairs and the Mixed Pairs had to be abandoned half way through the games due to continuos heavy rain. Normal service was resumed on Sunday morning and all four games were completed, in the Men’s Pairs Allen Bowen and Scott Malden of San Luis were too good for Del Gunning and Gary Thorpe of Vistabella as were Brian Harris and Richard Lee of El Rancho who took on the second Vistabella pairing of Martin Foulcer and Arthur Brown. 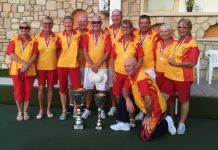 In the Mixed Pairs the Vistabella pairings suffered a similar fate, Stuart Allman and Maggie Furness went down to Kath Reid and Ian Kenyon of San Luis and Lin and Charlie Watkins were narrowly beaten by Sue Milner and Gary Raby of San Miguel. 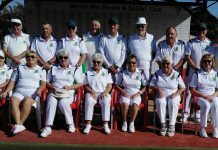 Sunday afternoon saw the semis of the Ladies Singles and the Mixed Triples. 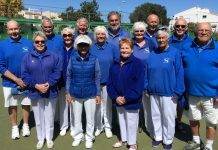 The Ladies Singles guaranteed an improvement in Vistabella’s luck as Maggie Furness played Lin Watkins and won, in the other semi Carol Broomfield of Quesada proved too strong for La Siesta’s Sue Jordan. 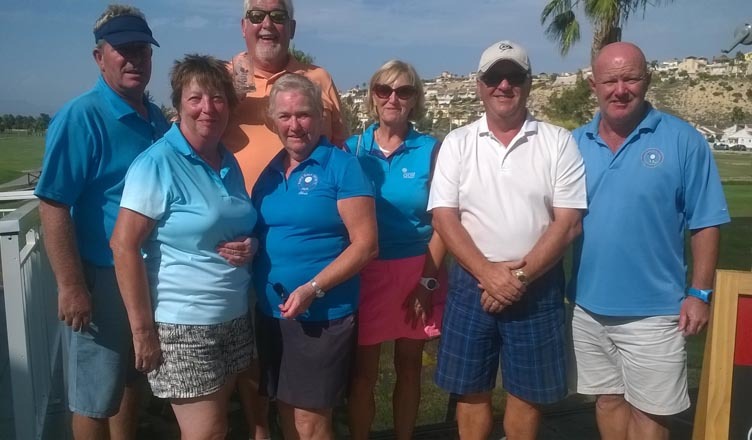 Both Mixed Trips games were nail biters Kath Reid, Steve Simmons and Ian Kenyon of San Luis beat San Miguel’s Noel Davis, Gail and Fred Willshire by one shot. Ann Marie Stevenson, Drew Gerrard and Colin Lindgren of Emerald Isle did the same to San Luis’ Allen Bowen, Sue Cooper and Scott Malden. 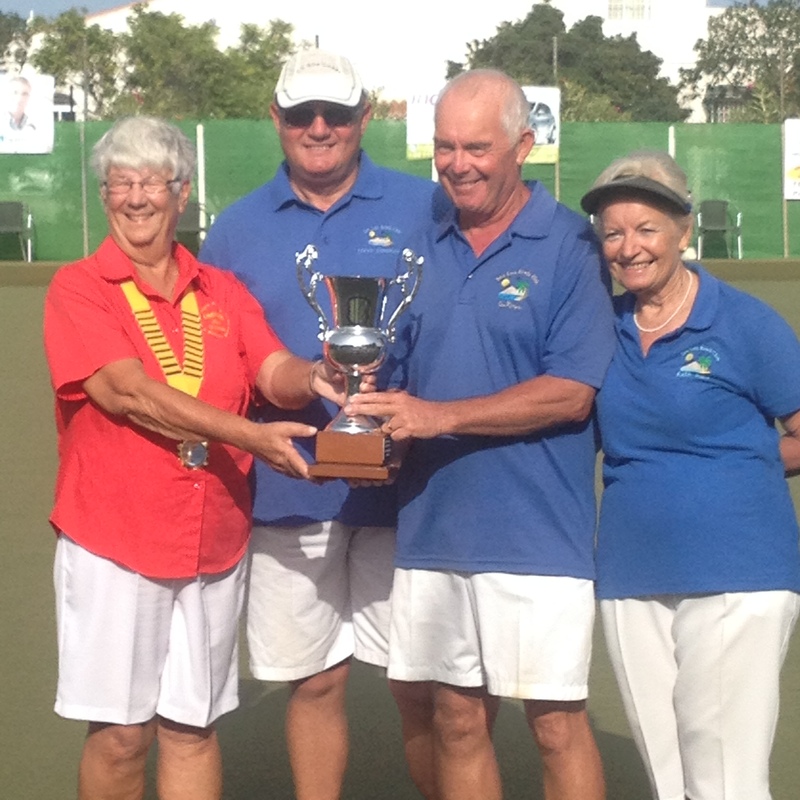 The final Semis were held on Monday morning the Ladies Pairs saw Emerald Isles Mary Whitelock and Ann Marie Stevenson overcome La Siesta’s Irene Laverick and Sue Jordan, while San Miguel’s Gail Willshire and Ann Eagle had a narrow victory over Jan Pocock and Sue Cooper of San Luis. 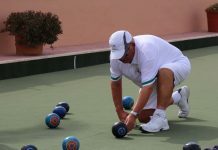 In the Men’s Singles Terry Morgan of Quesada led from the start against San Miguel’s Noel Davis but in the other game the lead see-sawed until the 20th end where San Luis’ Ian Kenyon and Emerald Isles John Rimmer were tied at 19 all only for John to take the game with a two on the final end. The Finals commenced Monday afternoon with the Men’s and Ladies Singles finals. 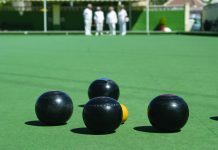 In the Ladies final things were tight to begin with but after nine ends Maggie Furness slowly took control to beat last years champion Carol Broomfield 21 – 9. 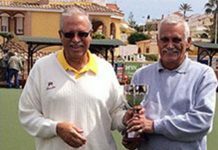 The Men’s final was much closer the lead swopped a few times and stood at 17 all after 24 ends but John Rimmer then took the next two ends to win by 21 – 17 over Terry Morgan. The final four disciplines were decided on Tuesday. 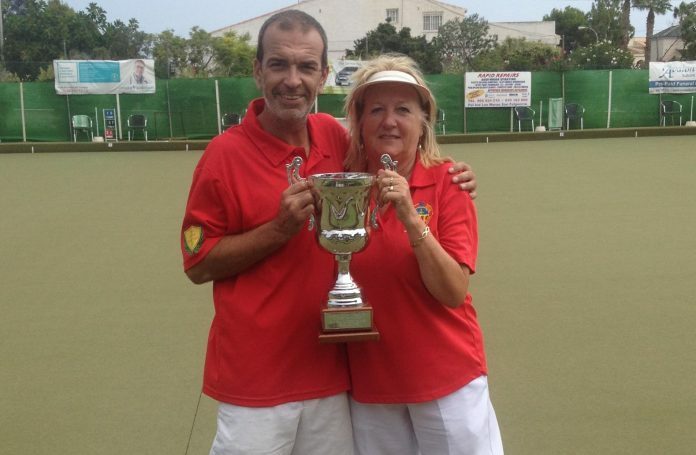 In the Mixed Pairs last years winners Sue Milner and Gary Raby retained their title with a 19 – 11 victory over Kath Reid and Ian Kenyon. 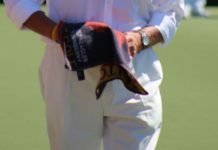 Allen Bowen and Scott Malden proved just too strong for Brian Harris and Richard Lee with a 21 – 5 victory but the other two finals went right down to the wire. 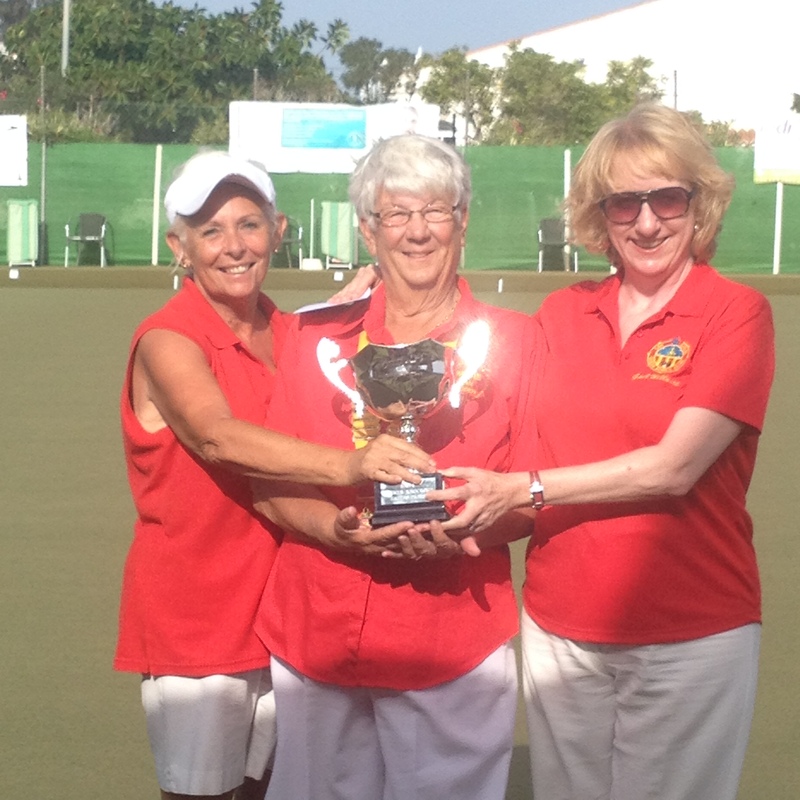 In the morning Gail Willshire and Ann Eagle produced a 21 – 20 win over Mary Whitelock and Ann Marie Stevenson. 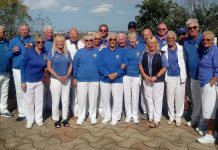 The afternoon saw Ann Marie this time partnered by Drew Gerrard and Colin Lindgren suffer a similar fate in the Mixed Triples losing 19 – 20 to Kath Reid, Steve Simmons and Ian Kenyon, a much happier result for Kath and Ian who had lost in the morning. 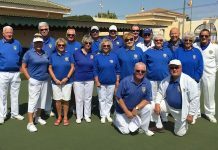 Thanks go to our umpires Jean Cooper (twice), Sue Johnson and Barry Norris and to June and Keith Jones who marked the singles games and to Arthur and Barbara Brown the competition organisers plus our sponsors DeVere Spain. 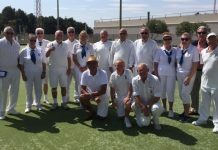 Previous articleSan Luis Bowls Club Report 14.09.18.